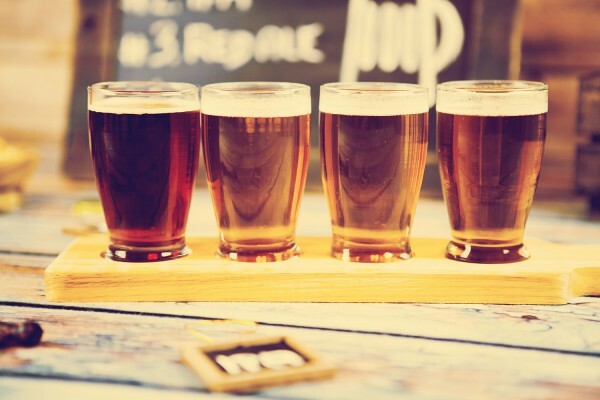 Alaska is known for epic scenery that inspires exploring, and if you like to adventure with a beer in hand, the state boasts dozens of local microbreweries. If your idea of exploring is more in line with sampling the best brewpubs and eateries, Alaska will not disappoint. The beer and distillery industry has recently grown in Alaska, a state that can now add many neighborhood craft breweries to its long list of bragging rights. Within the past five years, 10 breweries joined the local beer scene and more distilleries are opening their doors. Alaska fruit wineries are also burgeoning in a state where homegrown wine may seem like a challenging endeavor. These new breweries caught our eye and are sure to please any beer or wine connoisseur on a trip of a lifetime. Alaska’s newest craft brewery opened in March of this year in Anchorage’s Mountain View neighborhood. Resolution Brewing Company features Belgian-inspired beers and caters to visitors who are interested in the brewing process. There are no “secret recipes” here. The owners share their method, techniques and are also open to feedback and collaboration. Alaska Berries touts itself as the first and only “Alaska grown” winery in the state. Located in the Kenai Peninsula town of Soldotna, a short drive from Cooper Landing, the owners grow all of the fruit and berries on their farm, enjoying complete control of the entire process; from picking the fruit to bottling the wines. Visit the estate winery in Southcentral Alaska to enjoy unique blends like blueberry wine, gooseberry wine and Redoubt Rhubarb Raspberry wine, named after Mount Redoubt, an active volcano that is visible from the farm. Located in the picturesque Southeast town of Sitka, Baranof Island Brewing has been handcrafting beers since 2010. The beer-loving owners take advantage of a local Sitka resource; the pristine water from Blue Lake, located in the Tongass National Forest, is used for brewing their quality beers. Sip on a sample in the taproom or take a growler with you to go. This craft brewer nestled in South Anchorage opened its doors in 2012. By using barrel fermentation with brettanomyces, a wild yeast known as “Brett” that most brewers try to avoid, Anchorage Brewing Company takes pride in the fact that it seeks out extreme measures to make unique, quality beers. If you’re an aficionado for the flavorful beers that “Brett” helps produce, pop in to their tasting room for a cold one.